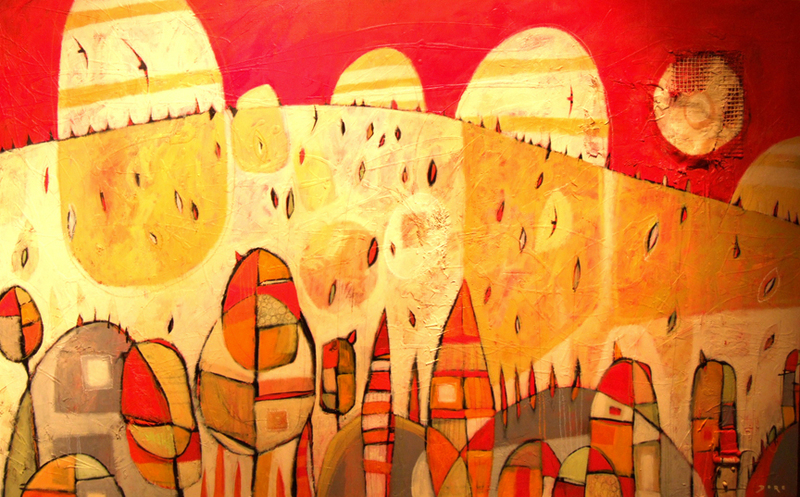 On Friday, May 6th, Mirada will host a reception for English-born artist, Christian Dore, where he will unveil his latest contemporary mixed-media paintings. “Lush Life” is an exhibition highlighting Dore’s immersion in the culture of his new homeland of Colorado and the tribal influences of the North American Indians. This exhibition will run May 7th through May 29th. Born and raised in Kent, England, Christian Dore’s artistic career began in London as a graphic designer for the BBC. 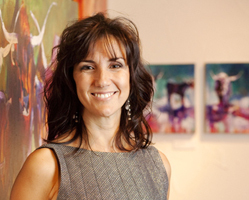 In 1999, Dore moved to the United States, and his passion turned to painting the extraordinary landscapes of his new home of Colorado through his truly unique perspective. It is the warmth and optimism of the Colorado landscape, enhanced by the dramatically changing seasons, which set the tone for Dore’s dazzlingly varied color palettes. 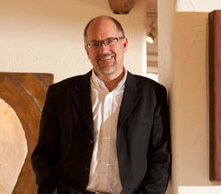 His work is tribal in appearance with a distinct colorful texture that exudes Colorado and the artistic techniques of the North American Indians. Christian Dore works a painting over and over, endlessly layering with paint and mixed media elements, until he achieves the intensity of color and textural buildup which makes his work so distinct. Creating intense areas of color with heavily textured surfaces, Dore takes the expressive qualities of color to their fullest extreme. His belief in an enchanted inner vision leads to the creation of highly imaginative paintings, inspiring introspection and thought on the part of the viewer. Expressing his feelings about his surroundings, rather than illustrating them, Dore’s work immerses the viewer in a phenomenal visual experience as well as a rich inner journey. Christian Dore at Mirada Fine Art, Rain, Acrylic/Mixed Media on Canvas, 24" x 72"
Pablo Milan at Mirada Fine Art, Spirit Horse, Oil on Canvas, 48" x 24"
When Mirada Fine Art opened its doors in November 2009, it did so featuring the spectacular work of southwestern artist, Pablo Milan. We were absolutely thrilled that this legendary painter chose Mirada to represent him in Colorado. Every time we hang a new Pablo Milan painting on our gallery walls, we continue to be excited by his compelling vision of the southwest. This spectacular new painting is called 'Spirit Horse' and measures 48" x 24". This piece will be the centerpiece of any room it is hanging in. In the may edition of American Art Collector you'll fine a great article on one of Mirada Fine Art's amazing artists, Andree Hudson. She is part of their 'Artist Focus' section. If you don't get that magazine, here's a copy. "Why is your gallery located THERE????" This is one of the reasons. There aren't a lot of galleries where you can look out the window and see a deer hiding behind one of your artist's sculptures. (In this case, the sculpture is by John Ferguson.) If I had been quicker this afternoon, I would have captured his six friends as well. Welcome to our first 'Mirada Art Talk'. 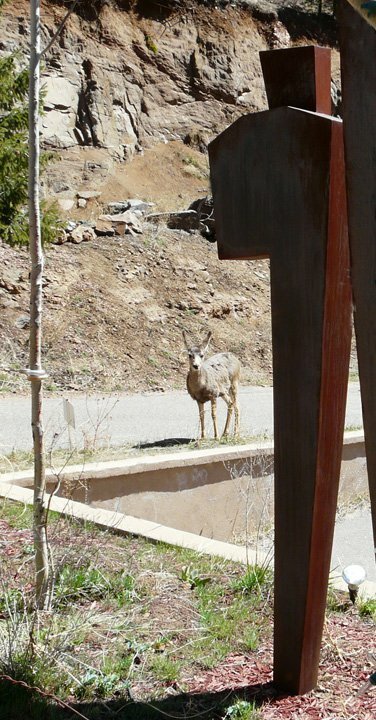 As often as we can, we'll give our opinion on Colorado exhibitions and public works of art. We'll have artists and experts tell us what they think, and we'll get the remarkable 'Blog Dogs,' Linus and Augie, to voice their opinions as well. We'd love to hear what you think as well...so please join in. 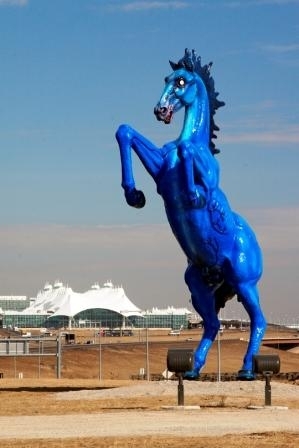 We thought we'd start with the obvious choice and get it out of the way: the famous 'Blue Mustang' at Denver International Airport. It has to be the most controversial public art in the entire state. The artist, Luis Jimenez, was actually killed by this piece while he was working on it, but it was completed by his sons, Adan and Orion, and was installed in 2008. It's been called everything from "Bluecifer" to "Satan's Steed." EVERYONE has an opinion! And so do we. 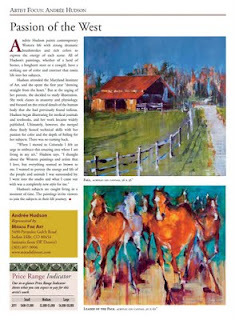 Our guest reviewer for this discussion is artist Andree Hudson, who is famous in part for her remarkable equine acrylic paintings. Wow, the Blue Mustang! This sculpture took the life of its creator...that color of blue that we would find on a vintage GTO...its eyes that are cursed and seems somewhat alive as you drive by at the entrance to DIA airport. It could possibly come to life in the black of night and take one of the cars passing by. I swear I have seen it in a different position in every passing! Seriously is this a successful work of art? I love art that evokes a strong sense of emotion! Do I want to take a longer look as I drive by this demonic creature? Yes I think I do! 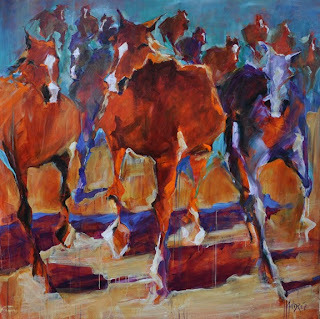 Andree Hudson, Running Along, Acrylic on Canvas, 60" x 60"
The Blue Mustang. That's a tough call. Although I'm not a huge fan of this particular piece, I don't know why people get so worked up about it. He's a little mean looking, but I'm not ready to petition the governor to get rid of it. On the other hand, I'm not about to 'friend' the Blue Mustang on Facebook either. It's a blue horse with glowing eyes...ok, fine. All I know is that public art should never be put up for a vote and test-marketed. 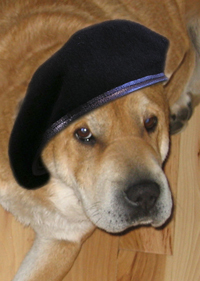 Ok...first of all, why has this beret been photo-shopped on me? This is an outrage! 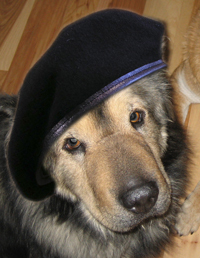 A dog can't be 'arty' without wearing a ridiculous beret? I noticed that the artist and the gallery owner didn't get stuck with funny hats. And when was the last time someone actually wore a beret? It was probably Jerry Lewis in the 40s. You want me to talk about public works of art and be taken seriously? How about taking this hat off first? You'll probably want me to give it 'two paws up' or some cliche crap like that. Not this time. On principal I will not discuss the Blue Mustang as long as I am wearing a beret.